Showing 1 - 12 of 12 articles tagged "Futurama"
Watch a clip from Sunday's episode that will display a banner reading: "Bring Back Futurama. "Netflix couldn't have been more supportive," says Groening of his first new TV series in two decades. Why do YouTube clips of Futurama's Neutral President have an equal number of likes and dislikes? Is an algorithm to blame, or is it a collective effort by a bunch of committed nerds? . 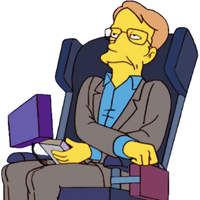 Stephen Hawking was The Simpsons' "most intelligent guest star"
The proposed series follows a young woman who must manage an out-of-control natural history museum. All 140 episodes of Matt Groening’s animated comedy will be available for streming on Oct.
All 140 episodes of the Matt Groening animated comedy will air on Syfy, starting Nov.
Matt Groening, exec producer David X.